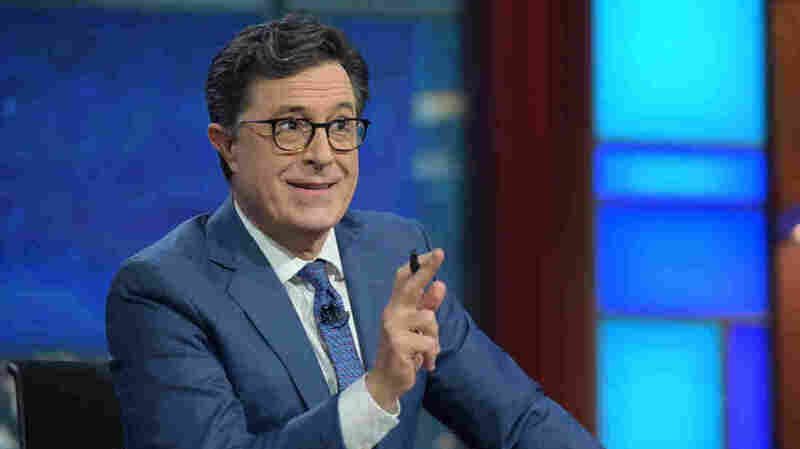 'Late Show' Host Stephen Colbert Says He's Finally Found His Post-'Colbert Report' Voice The comic initially avoided joking about politics on The Late Show for fear that he would fall into his Colbert Report persona. He says, "Now, I have no qualms about being sharp and satirical." For Stephen Colbert, taking over as host of The Late Show was not a hard decision. "I love a live audience," he says. "I love the grind of every day and I love the people I work with." It has been more than a year since Stephen Colbert took over as host of CBS' The Late Show, and he's finally feeling comfortable being himself and not a character. Before The Late Show, Colbert spent nine years playing the role of a self-important blowhard on Comedy Central's The Colbert Report. He tells Fresh Air's Terry Gross that he initially shied away from discussing politics or current events on The Late Show in an effort to differentiate himself from his Colbert persona. "It took me almost half a year to realize ... that you can have a highly opinionated, highly topical show as yourself and not essentially fall back into the basket of The Colbert Report," he says. "Now I have no qualms about being sharp and satirical and highly opinionated and saying whatever's on my mind as quickly as I can." This fall, Colbert's mind has been on the election. He's been doing political comedy nearly every night, but don't expect him to be at his Late Show desk on election night. Colbert's Nov. 8 show will be pre-empted by CBS News coverage, so instead he'll be hosting the Showtime special Stephen Colbert's Live Election Night Democracy's Series Finale: Who's Going To Clean Up This S***? He promises guest stars, special political commercials, musical guests and, of course, election results. I thought maybe I would make some big mistake with the character because he would say terrible things. And I got away with some of the terrible things he would say or do because it was all filtered through his mask, but if I didn't maintain the mask, it would just be me being terrible. I love a live audience, I love the grind of every day and I love the people I work with. And it gave me all the things that I loved, and that was not a hard decision. ... To know that I could continue that was the greatest draw, and I also couldn't think of anything after The Colbert Report that would seem like a promotion other than taking over for Dave. We would talk about a single subject maybe for a week, or we would think about one idea that we might do three or four days from now, or maybe two weeks from now as we developed the idea and how my character might put himself in that news story. Now, it's how fast can you talk about everything that happened in the news or in popular culture in the last 24 hours, and it's much faster than we used to work. The joke I've made is that we went from go-kart to NASCAR, with all the advertising stickers on the side of our car, too. But it's a different, much faster way of working than we used to. It's less essay; it's more like reportage with jokes than a columnist. I used be like a columnist and now I'm writing daily headlines. To do one of these jobs you got to kind of love the flaming toboggan ride of it. That's it. It's the movement forward, because it never stops. You gotta love the downhill hurtle. There's no finish line. You got to just love missing all those trees that you could've hit today.